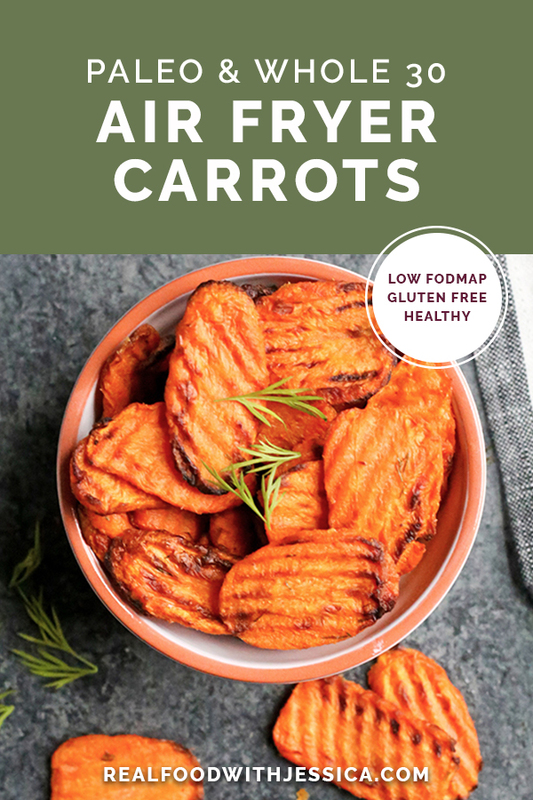 These Paleo Whole30 Air Fryer Carrots are easy, quick, and perfectly cooked. 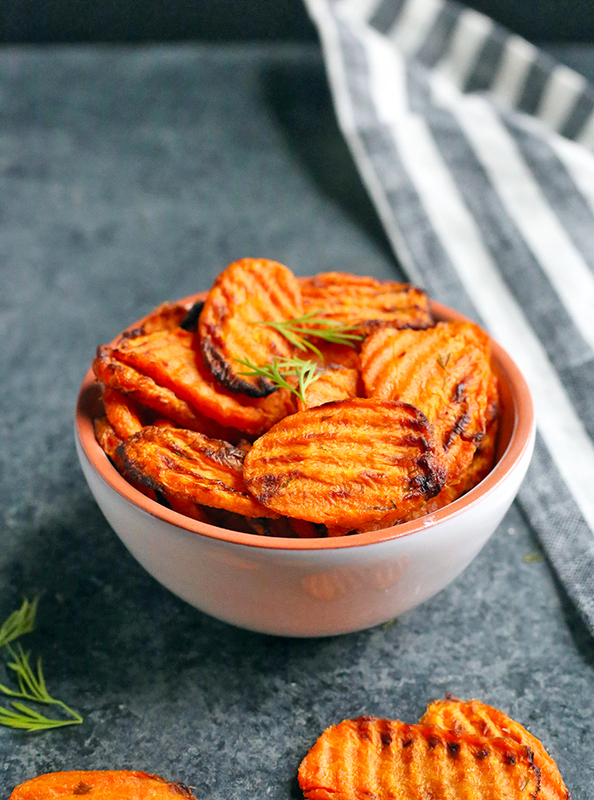 A great side dish that everyone will love. Gluten free, dairy free, and low FODMAP. I felt pretty intimidated when I first bought my air fryer. How do I use it? What should I make? What are all these knobs? This was the first recipe I made because I figured if it came out bad, it’s only a couple dollars wasted. But they came out so delicious! The best carrots I’ve ever had! I totally went the easy route and bought the carrot chips at the store. That’s real life. I don’t always have time to cut veggies and that’s a short cut I take. I’m sure you can cut them yourself, just make sure they are about 1/4 inch thick. I did add some fresh dill to this batch, but most the time it’s just salt and oil. It’s a great starting place though. Add herbs and spices as desired. 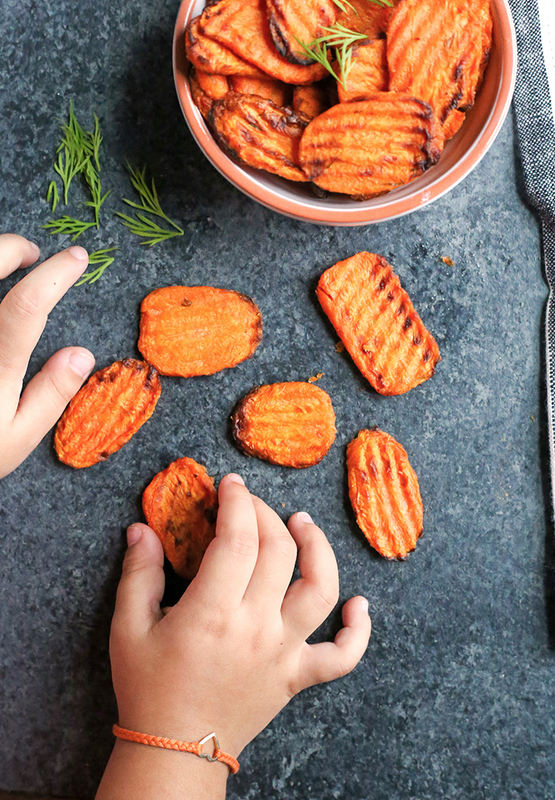 The carrots are tender, sweet, and nicely browned. We always end up eating about half of them straight from the basket because they’re so good. My 3 year old even loves them which makes me happy. I think you will love these carrots because they are so easy and quick. A great beginner recipe as well! HERE is the air fryer I have and love. Set the temperature to 375° on the air fryer and turn it on. Add the carrots to a bowl and toss them with the oil and salt. 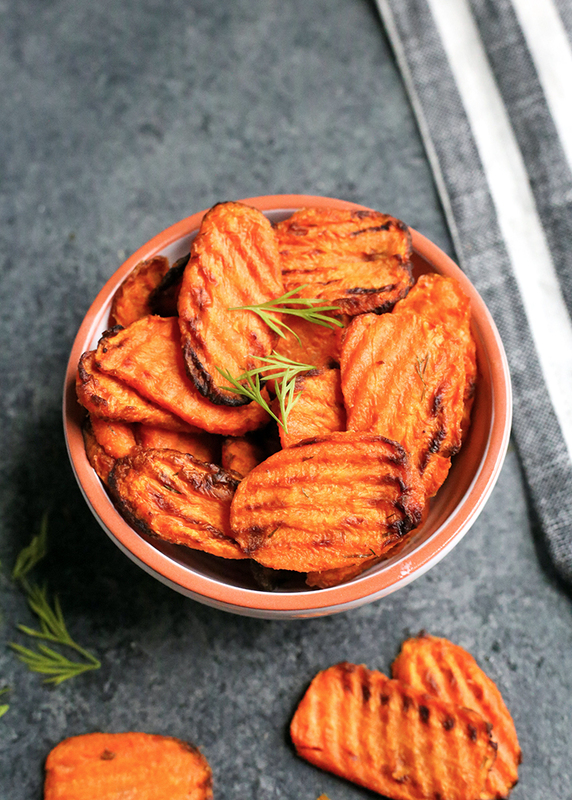 Spread them evenly on the cooking rack and place it in the air fryer. Cook for 12 minutes, flip and cook an additional 3-4 minutes. Make sure to use a hot pad when removing the cooking rack. 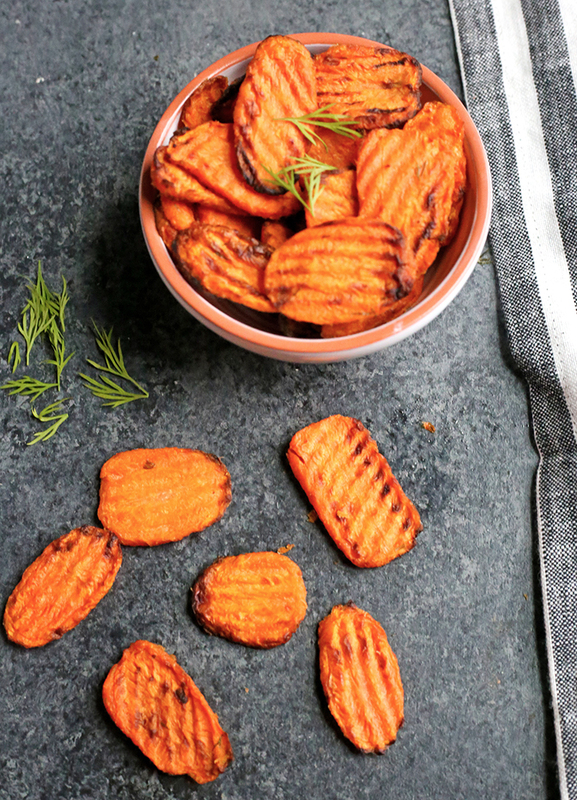 If you're air fryer is smaller, you may need to do this in batches. I usually double this recipe so there are leftovers. Hi Veronica- yes, the carrots are raw when they go in. They come sliced like that, but if that’s not available to you then you could cut them into 1/4 inch slices or sticks and try it. Hope that helps! Hi Kathy- I don’t list calories because I think focusing on eating real food is more important than calories. Also, if you are so focused on calories then you are not listening to your body for when it’s satisfied, you are just eating to a certain calorie amount. I do know some people have to watch carbs and sugars, but being afraid of eating too many carrots shouldn’t be a thing. If you really want to figure out calories then you can use a site like My Fitness Pal, but I don’t plan to ever post them because I don’t encourage it. I could go on more, but I won’t. I hope that helps you understand why I don’t calculate all that. I bet I use more of your recipes than any other site so I don’t want to sound critical. Very dependable. But these carrots weren’t all that great for me. Carrots can get rubbery or burnt. Is there any way to get them crispy like French fries? I’m so sorry they didn’t turn out for you, Carol! They don’t get crunchy like french fries, but they shouldn’t be rubbery. 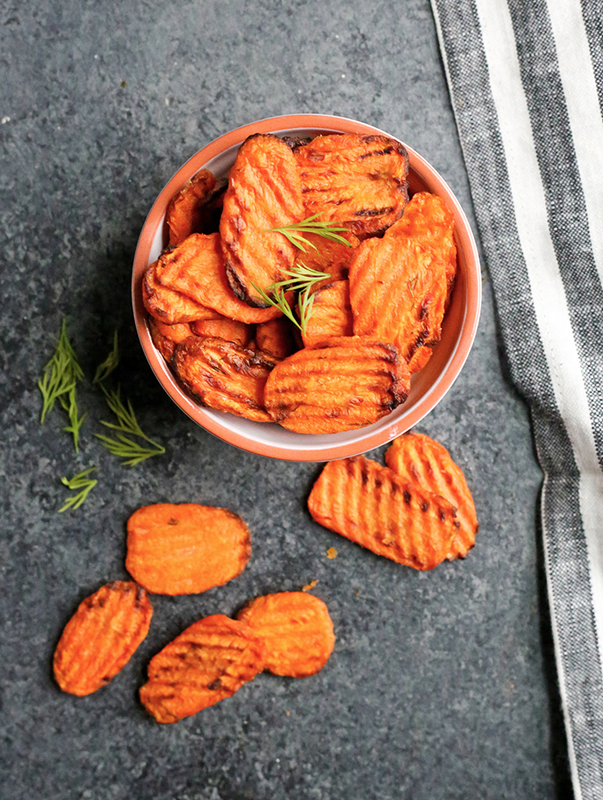 They should be tender and taste kind of like cooked sweet potatoes. Did you use the carrot chips? The small ones can get pretty brown, but still edible.